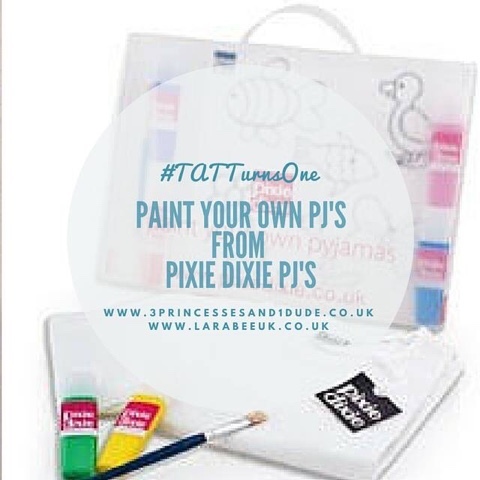 Today we have a set of Paint Your Own PJ's from Pixie Dixie (RRP £29.99).The paint your own pj's have featured previously on #ToddlerApprovedTuesday thanks to the lovely Claire at The Free Range Family when her lovely girls reviewed them back in August, in fact they had so much fun they made plans to start their own pyjama business! Make sure you pop over and read her review. Each set consists of a pair of 100% cotton super soft pyjamas, 4 fabric paints and a brush. And whats more you can wash them over and over and your design stays put! UK only for this giveaway. The winner will chose BOYS or GIRLS pj's and can can chose from a variety of sizes between age 1-2 and 11-12. The prize will be sent direct from Pixie Dixie HQ.